Moving your race car's battery to the rear of the car helps reduce the nose-heaviness problem inherent in most front-engined designs, but heavy-gauge battery cable is mighty expensive stuff when you're on a tight budget. 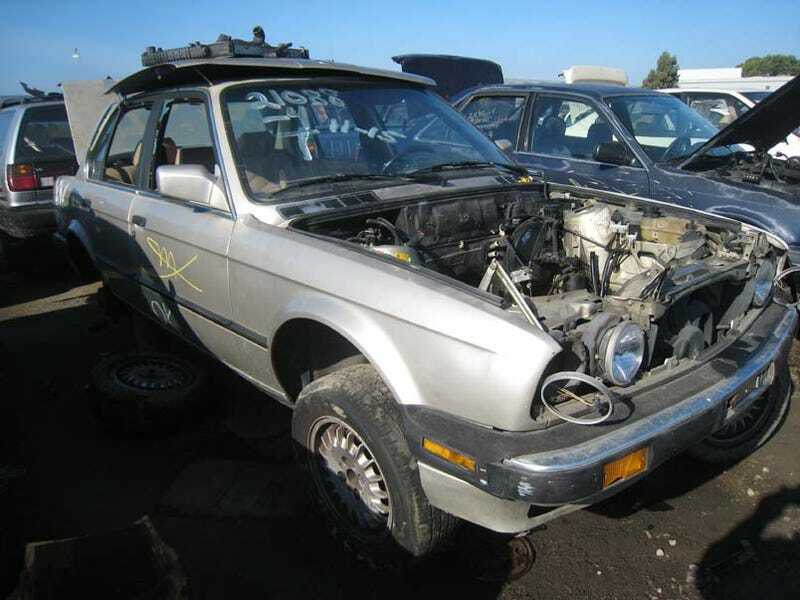 When you're trying to squeeze under that $500 limit at the 24 Hours Of LeMons, you won't be buying any new cables… but your friendly wrecking yard has the solution! BMW E30s are easy to find in the self-service yards, and they came right from the factory with a very nice trunk-mounted battery setup. The big self-service junkyard chains generally have a single price for all battery cables, which means that the 15-footer that runs from the trunk to the engine compartment will cost the same as a skinny 18" job from a Sentra. When the Half Price Sale is on, we're talking about $7 for both cables and terminals; not a bad deal for 20 pounds of copper! For its trunk-mounted battery setup, the Black Metal V8olvo used some 1-gauge welding cable I'd hoarded for years, but then the LeMons safety requirements mandated a battery cutoff switch. That meant we needed about 8' of additional cable in order to install our switch. I went right to this 325i, to do a little shopping. All you need to do to remove the positive battery cable is get the carpeting and passenger-side interior trim out of the way, then start clipping various tie-downs and clamps. BMW believes in absurd levels of overengineering leaving nothing to chance, which means this task will take a little while, but it's nothing very challenging. Speaking of overengineering, why did a small car like the E30 need a super-fat 00-gauge battery cable? Was there a little-ordered in-car arc-welder option, or perhaps an antiaircraft searchlight mounted on the roof with certain trim packages? In any case, here's the new cable hooked up to the battery in our (somewhat cluttered) Volvo's trunk. Here's the switch installed and wired. Thanks, BMW! Note: trunk-mounted batteries in street-driven cars need to be fully enclosed and vented outside the car, because otherwise they'll fill your trunk up with hydrogen and you'll go up like the Hindenburg.